The term ‘CRDi’ commonly refers to diesel engines. Although, there is a similar technology which the petrol engines also use it is known as Gasoline Direct Injection (GDI) or Fuel Stratified Injection (FSI). Both these technologies have a similarity in design since they consist of a common “fuel-rail” which supply fuel to injectors. However, they considerably differ from each other in pressures & type of fuel used. In Common Rail Direct Injection, commencement of combustiontakes place directly into the main combustion chamber located in a cavity on the top of the piston crown. Today, manufacturers use CRDi technology to overcome some of the deficiencies of conventional diesel engines which were sluggish, noisy and poor in performance when implemented especially in passenger vehicles. The CRD-i technology works in tandem with the engine ECU which gets inputs from various sensors. A Common Rail system uses a ‘common-for-all-cylinders’ fuel-rail or in simple words a ‘fuel distribution pipe’. It maintains optimum residual fuel pressure and also acts as a shared fuel reservoir for all the injectors. In CRDi system, the fuel-rail constantly stores and supplies the fuel to the solenoid valve injectors at the required pressure. 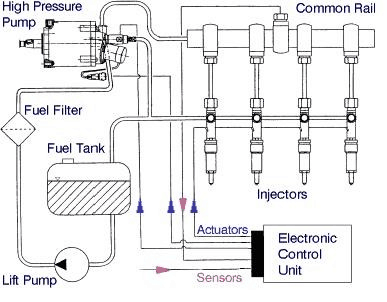 This is quite opposite to the fuel injection pump supplying diesel thru’ independent fuel lines to injectors in case of earlier generation (DI) design. A high-pressure pump generates pressurised fuel. The pump compresses the fuel at the pressures of about 1,000 bar or about 15,000 psi. It, then, supplies the pressurised fuel via a high-pressure pipe to the inlet of the fuel-rail. From there, the fuel-rail distributes it to the individual injectors which then inject it into the cylinder’s combustion chamber.